I just setup my RetroPie and tested out a game. I then shut it off using the power button. When I tried starting it up again it doesn’t go past this screen. I unplugged it for an hour and tried again but no luck. How can I get it to work again? I think there was an issue with my sad card. Tried another one and had no issues. You have a kernel panic, which means that the kernel encounters something unrecoverable so it stops there and stay there. You can turn it off at such a kernel Panic and turn it on again after a few seconds. If nothing is corrupted it should come up properly. If not, try another SD-card. 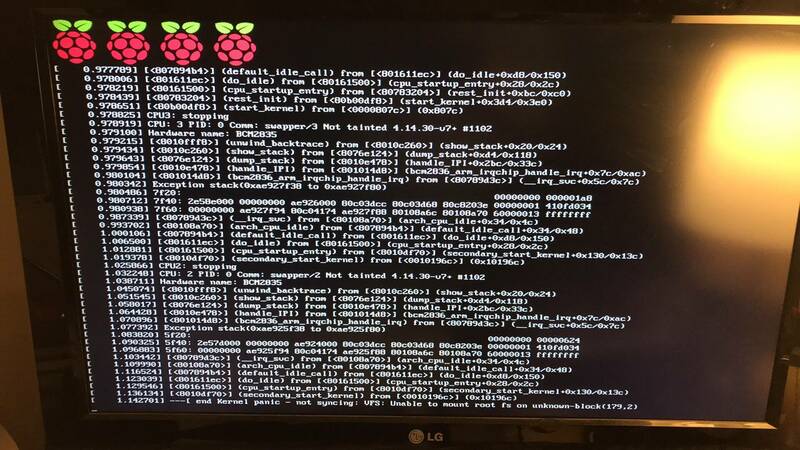 Raspberry pi shut itself down without warning and now refuses to boot an operating system? Thunder bolt icon appears, Pi boots, Keyboard does not work. What could be wrong?